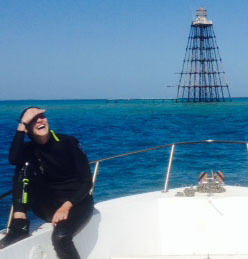 Rosemary is proud to represent the NOAA Corps as a junior officer stationed at the Florida Keys National Marine Sanctuary since October 3, 2014. Previously, she was assigned to the hydrographic research vessel, NOAA Ship Rainier, which primarily operates in Alaskan coastal waters. While aboard, Rosemary qualified as Officer of the Deck, was trained as a NOAA Working Diver, managed several hydrographic surveys, and was responsible for numerous collateral duties such as public relations and damage control. Rosemary holds a Bachelor of Science in marine science from Coastal Carolina University. While there, she conducted an independent research project on coral diversity in Discovery Bay, Jamaica. That experience contributed to her fascination about coral reef ecology. Following her undergrad, LTJG Abbitt interned at NOAA’s Atlantic Hydrographic Branch in Norfolk, VA. Rosemary has always felt she was born to be in and around water, and her name actually means "Dew of the Sea" in Latin. LTJG Rosemary Abbitt prides herself at being a “go to” officer, and she enjoys volunteering to provide community services. Above all, she is extremely passionate about promoting what NOAA is all about: Science, Service, and Stewardship!